As far as the weather went, it wasn’t a promising weather forecast on Sunday morning as people streamed along the narrow country lane on the way to Secret World in Somerset to attend the ‘Time for Badgers’ event organised by the Badger Trust last Sunday. It was nine o’clock in the morning and everyone had their fingers tightly crossed that the rain wouldn’t fall. The crowd arrived in all sorts of vehicles – landrovers, mobility scooters, coaches, cars and on foot. There were children, adults and those of a slightly older generation and as more and more gathered, the warmth generated by hundreds of people grouped together in a common cause made up for the slightly chill morning. Some people had set off very early in the morning from the High Peak district, others from the Midlands and more from all over the south of England. They weren’t here just for fun but to register the depth of their feeling against the Government’s imminent badger cull. To do this, they came together to provide the cast for a short film that will show clearly that those against the cull come from all ages, occupations and widely differing backgrounds and interest. Environment Secretary Owen Paterson may choose to dismiss those who are against the badger cull as animal rights activists, sad sentimentalists or clueless urbanites, who don’t understand rural affairs; but those who came along to Secret World on Sunday were far from sentimental, ignorant or extreme. Many come from rural backgrounds and/or live in the countryside. All value their wildlife, but feel their views are being swept under the carpet in pursuit of a policy that Lord Krebs, an eminent scientist with considerable knowledge of bovine tuberculosis and badger culling, continues to describe as ‘crazy’. 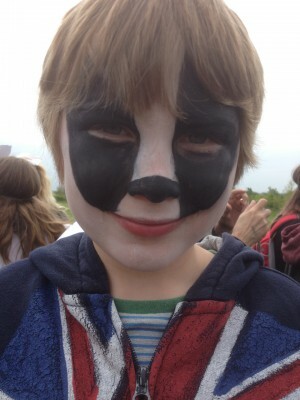 There were no celebrities present at Secret World that day, showing just how many ‘ordinary’ folk care enough about preventing the badger cull to make the effort to attend an event without the added lure of a famous personality. Once there, filming took priority and the crowd were good-natured enough to be pushed, pulled and prodded into place by a crew of experienced cameramen, directors, production designers, editors and post-production supervisors, who all gave their time and talent for free. Normally productions such as this would rely on well-rehearsed extras, but the purpose of Sunday was to provide a novel and peaceful way for people to express their deep concerns about the Government’s policy on bovine TB and badger culling – which they did with patience and good humour, and also for free, standing still for almost two hours whilst cameras rolled from a weird and wonderful array of angles. The staff and volunteers of the Badger Trust, other badger groups and Secret Word, which also hosted the event, all did a grand job as well. For those who made it, it was a special day out. We were lucky with the weather too. The rain didn’t fall, the winds didn’t howl across the Somerset Levels and even the sun smiled down on us right at the end. We can’t give away too much yet about what the film contains, but we’re all looking forward to the final results, which the production crew promises to make available as soon as possible. We’ll keep you posted.